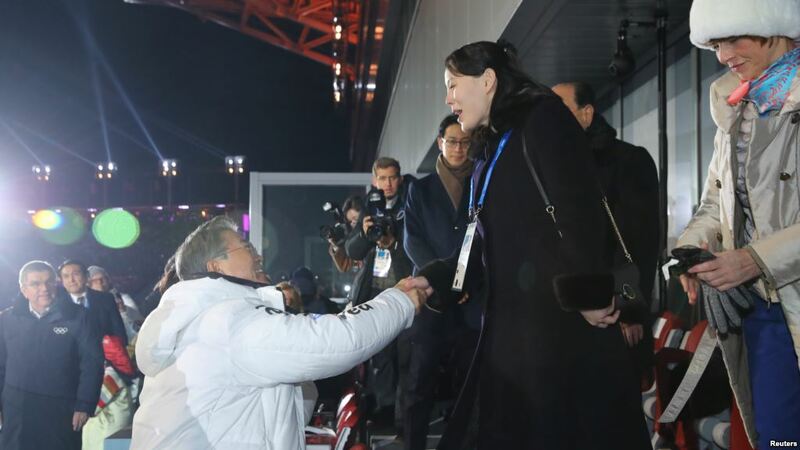 A sister of North Korea’s leader shook hands with the South Korean president as representatives of the two countries sat together at the opening of the 2018 PyeongChang Olympics. Sitting nearby was Japanese Prime Minister Shinzo Abe and the head of the United States delegation, Vice President Mike Pence. On Thursday, the two men met at the prime minister’s home in Japan. They spoke of strengthening the military alliance between their countries to answer threats by North Korea. As is Olympic tradition, Greece, which held the first modern Olympic Games in 1896, led the parade of athletes into the sports stadium in Pyeongchang. Other countries followed in alphabetical order, based the Korean alphabet. Athletes from the two Koreas marched in together under a white flag, which has a blue image in the shape of the Korean peninsula. The ceremonies took place as the world looks for clues about the peninsula’s future while North Korea continues its nuclear and missile activities. Before the ceremony, South Korean officials released a statement from President Moon Jae-in. He said, Athletes from the two Koreas will work together for victory, and that will resonate with and be remembered in the hearts of people around the world as a sign of peace. The North has sent nearly 500 people to the PyeongChang Games. Its delegation includes government officials, athletes, artists and cheerleaders. More than 2,900 athletes from 92 countries will compete in the games, making it the biggest Winter Olympics to date. One member of the North Korean delegation is Kim Yo Jong. She is the sister of North Korean leader Kim Jong Un, and believed to be his closest confidant. She is also the first member of North Korea’s ruling family to visit the South since the Korean War. Kim Jong Un himself has not left North Korea or met any head of state since 2011 - the year he became the country’s leader after the death of his father. Officially, Kim Yo Jong, at the age of 30, is just a member of a delegation led by 90-year-old Kim Yong Nam. She and the rest of the North's delegation are to join Moon for a meal on Saturday. The United States has repeatedly warned its ally South Korea to continue pressure on the North Korean government. But Vice President Pence has not ruled out a meeting with North Korean officials during his visit to South Korea. The vice president was asked about the possibility of U.S.-North Korea talks before leaving Monday on his six-day Asia trip. Let me say President Trump has said he always believes in talking, but I haven’t requested any meeting, Pence told reporters. He added, But we’ll see what happens. And they do not expect just to shake hands with him. NEXT week's NATO summit in Lisbon is likely to be one of the most crucial in the 61-year history of the military alliance. He began to look for a new job immediately after he was fired.